Our Jaqueline rainbow maternity gown is part of my new “Rainbow Collection”. a gorgeous fitted rainbow gown. The tribute for your Rainbow Baby. A staple for every studio wardrobe. This handcrafted gown provides a stunning fit that drapes beautifully over your curves to flatter your figure at every stage. Made with an elegant sweetheart neckline paired with off the shoulder long sleeves. 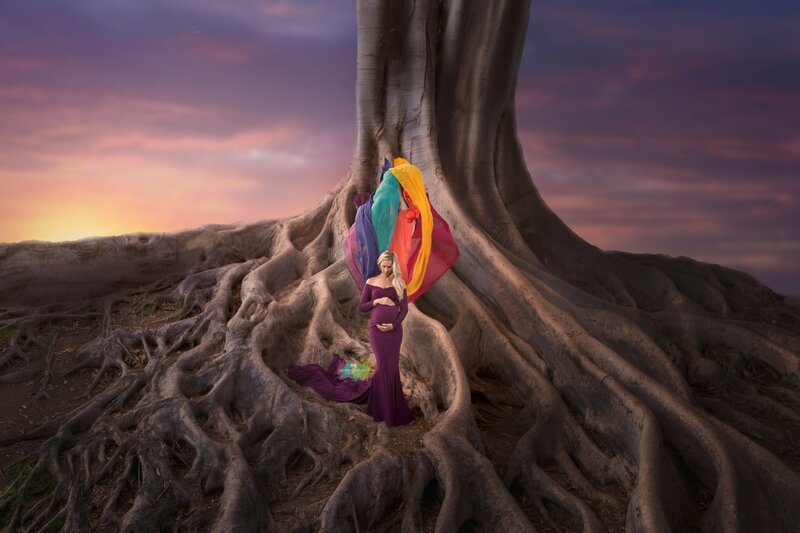 This dramatic dress comes with 6 panels of gorgeous light chiffon attached at the waist, in all the colors of the rainbow! Perfect for tossing or fanning out behind you. Choose from pastel, jewel or fall tones. Crafted in our soft stretch jersey knit. Be sure to check out our collection of Sequin, Couture, Tulle and Maxi Dresses.